The GM crop - engineered to resist Monsanto’s own weedkiller, Roundup - recovered only when he added extra manganese, leading to suggestions that the modification hindered the crop’s take-up of the essential element from the soil. Even with the addition it brought the GM soya’s yield to equal that of the conventional one, rather than surpassing it. Critics doubt whether the company will achieve this, saying that it requires more complex modification. And Lester Brown, president of the Earth Policy Institute in Washington - and who was one of the first to predict the current food crisis - said that the physiology of plants was now reaching the limits of the productivity that could be achieved. 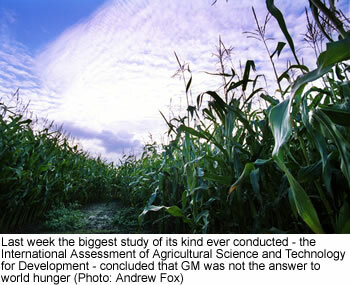 Last week the biggest study of its kind ever conducted - the International Assessment of Agricultural Science and Technology for Development - concluded that GM was not the answer to world hunger. This page contains a single entry by sal published on April 22, 2008 4:12 PM. Fluoride-Caused White Spots on Teeth Damage Kids' Self Esteem was the previous entry in this blog. Tipping Point in Autism-Vaccine Debate is the next entry in this blog.